By Ronald H. Limbaugh, and Willard P. Fuller, Jr.
We gathered more information about the Ruggles tract and its ownership path from Frank Blagen Jr., and we thank him for his major contribution toward trying to make this history accurate. Limbaugh and Fuller tell us in their book, Calaveras Gold, that at least part of the timber industry in Calaveras County had overextended in the twenties, and many had disappeared during the depression. They relate that even the giant, Pickering, failed during the depression and had to be reorganized before it could resume operations in 1937. Of particular interest to the Sierra Nevada Logging Museum sitting near the original site of the Blagen Mill, were the changes that took place in the timber holdings in Calaveras and Amador Counties. In 1909, a Michigan lumberman, known as “The Last of the Lumber Barons”, Charles Ruggles, purchased the huge Calaveras County timber holdings of Frank Solinsky and in the process, Frank Solinsky Jr. became Ruggles’s forester. In the twenties, Ruggles and Frank Solinsky Jr. formed the Calaveras Timber Company to serve as a holding company for the timber business. Death Notice for Frank Solinsky Jr.
Frank Solinsky Jr. died of a heart attack at his home in Mokelumne Hill in August, 1950. Solinsky, the son of pioneer California parents, was born in San Andreas, the son of the late Mr. and Mrs. Frank Solinsky Sr., pioneer attorney of Calaveras County. Solinsky was a veteran of World War II and commanded the famous California Grizzlies in France. He was discharged from the army with the rank of major. He was the west coast representative of the Calaveras Land and Timber Company. In 1901 Solinsky as a young man began the task of putting the famous “Ruggles” timber holdings together and by 1940 had bound into a single unit 55, 000 acres of virgin timber lands in Calaveras County alone. As the depression approached, Ruggles defaulted on the taxes and eventually the timber lands were taken over by the Detroit Trust and the Michigan Trust. Frank Solinski Jr. was still in the act as the local representative. The Calaveras Land and Timber Co, was formed to act on behalf of the timber owners (Detroit and Michigan trusts). Ruggles wanted to have the rail line that was built to serve Calaveras Cement in San Andreas and Pardee Dam near Valley Springs, to be extended up into his timber holdings, but by 1927 well before the depression hit most businesses, his Michigan operations had fallen on hard times, Ruggles was in deep financial trouble, and the extension of the railroad became a dead issue. Ruggles died in 1930 at the age of 84. From mergers with the Winton Lumber Company in Amador County and acquisition of the Brown Brothers Lumber Company’s holdings in Amador and Calaveras Counties, the Calaveras Land and Timber had become one of the largest timber owners in the southern Sierra. They held about 60,000 acres in Calaveras County and about the same in Amador County. When Blagen got into financial difficulty caused by his Northwest relatives pressuring Crocker Bank to withdraw the credit that had been promised to Blagen’s new operation, he was forced to sell out to Stockton Box Company, a subsidiary of American Box Company (ABC) , who continued to harvest the timber belonging to Calaveras Land and Timber. Some time after American Forest Products purchased the controlling interest in the Blagen Lumber Company, the contract with Calaveras Land and Timber was renegotiated with the result that the minimum that was to be purchased annually (40 million board feet) was reduced, and in exchange the so called Amador tract was separated from the deal. This later allowed the Winton Lumber Company to purchase the Amador timber and build a mill in Martell. WWII brought great demand for lumber and lumber products and as a result American Forest Products harvested timber at a frenetic pace.In 1943 AFPC built a mill and a company town south of West Point. The town was named Wilseyville after Lawrence Wilsey the manager of the Blagen Mill from 1939 to 1954, and that mill was specifically built to harvest the large quantity of prime sugar pine in that area. 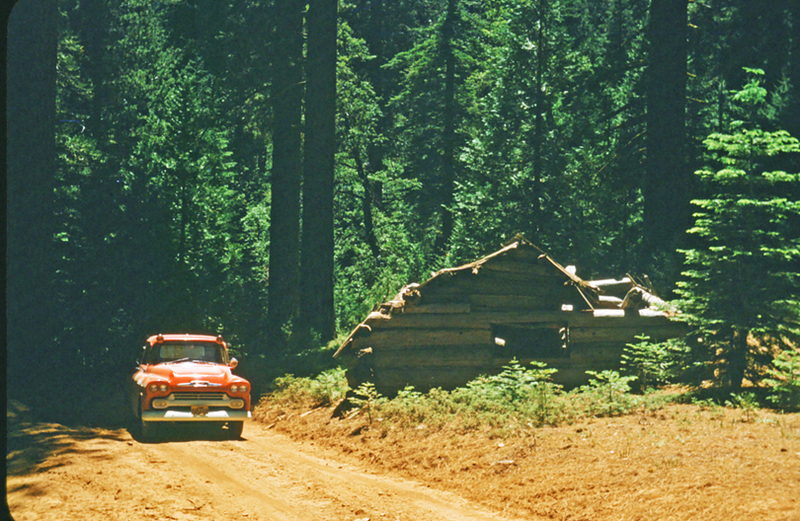 AFPC purchased the holdings of the Calaveras Land and Timber Corporation in 1961, but closed the Blagen Mill a year later. Another year after that, they also closed the Wilseyville mill. AFPC acquired the Winton Lumber Company and used the Martell Mill for its processing of both Calaveras and Amador timber. In 1970 or 1971, American Forest Products was taken over by Bendix Corporation who built the Martell operation into one of the largest lumber operations in the state. In 1981 Bendix divested itself of AFPC. In 1988, Georgia Pacific acquired AFPC including 125,000 acres of timber land and the Martell mill. In 1988, Red Emmerson of Sierra Pacific Industries mortgaged nearly everything they owned and bought 522,000 acres of timber land from the Santa Fe-Southern Pacific Railroad, making SPI the largest private land owner in the US. Sierra Pacific Industries also acquired all the GP holdings in both Calaveras and Amador Counties, immediately shut down the Martell mill, and hauled all of the logs on that deck to their other mills for processing.. SPI now sends all of its logs, except for Cedar, to Standard, next to Sonora, in Tuolumne County . The cedar goes to Chinese Camp for processing. Editor’s note: In early 2009, SPI closed both the Standard Mill and the Camino Mill. In 2011, SPI reopened a modernized mill at Standard. The Camino mill remains closed, and the Chinese Camp mill mills only cedar. In 2000, SPI secured permits for limited clear cutting, but has faced major opposition from environmental and business groups to any clear cutting on either public lands or their own holdings. SPI continues to harvest timber in Calaveras County, but the total amount of lumber from the trees of Calaveras County is very small compared to the years when timber was king. White Pines: an addendum to the story. Frank Blagen Sr., as we’ve said above, didn’t own the timber that he, and later AFPC, was harvesting, but he did acquire the land upon which the Blagen Mill sat, and where the town of White Pines was established. We know that he acquired this land, in 1938, from the Davies-Johnson Lumber Company, the company who owned the mill in Calpine, from where the Blagens moved to White Pines. This company was owned by Mr. Blagen and his Washington lumbering family, but at the moment, how Davies-Johnson had acquired the Calaveras property is unclear. The reason for the purchase, or perhaps just a transfer of ownership, is also unclear. More to follow, we hope. I am looking for historic photographs of the West Point Battalion/CDF. I passed this photo on to one of our foresters- Bill Solinski. He was grateful to find a photograph of his (great?) grandfathers cabin. The photograph was the missing link to locating the site of the cabin during an archaeological survey. Please contact me if you (or anyone out there) have CDF related photographs you can share. To the best of my knowledge, we don’t have any photos of the West Point Battalion of CDF. You might ask the volunteer Wilseyvelle Museum/Library. This was a response by one of our contributors to a request somewhat similar to yours. The 100 year history of the California Department of Forestry and Fire Protection, known today as “CAL FIRE,” will be the focus of a TCHS History Program on February 26 at 7 pm in the Tuolumne County Public Library Community Meeting Room at 480 Greenly Road in Sonora. CAL FIRE Battalion Chief Barry Rudolph will present an interesting chronological PowerPoint slide presentation of the origin of CAL FIRE operations in Tuolumne and Calaveras County . For many years Chief Rudolph has participated in numerous major fire incidents throughout Tuolumne and Calaveras County and has created an outstanding collection of historical fire photographs from the ground and from the air. Sierra Pacific never ran the Martell mill one day. They shut it down as soon as they bought it. Worked at Martel in the 80’s & Toyon in 70’s.Do u think i have a pension? Jim was kind enough to send us this message when I asked him for some assurance that what he said above was correct. Well, it was almost 9 years ago now, but as I recall, I was the Business Agent for Lumber and Sawmill Workers back then. March 31 1997 was our last day of employment in Martell. SPI’s log trucks hauled all the wood in the decks to their other mills, it (the sawmill) never ran again after that. His (Red’s) youngest son Mark, and Joe Gonyea (Timber Products Inc), bought the Particleboard plant below the sawmill, and have continuously operated it to the present time. It is still Unionized. We were also successful in organizing his 3 plants in Tuolumne County in 2001, Standard, Chinese Camp, and Keystone. Under the old Westside Local Union 2652. Also, I have many pictures of the operations in the woods in the late 40’s 50’s and 60’s I could share with you sometime. I collected many of them, and my father took many of them, as he drove logging truck for 25 years for Winton, McDonald and American Forest Products. We have corrected this part of the story, so it may not now be clear to the reader what was incorrect. I worked at the sawmill at Martell for 10 years, 1971-1981. I had been in the carpenters union in the bay area so when I arrived there I only had to pay my dues and start to work. Frank Podesta was the union rep. I have always wondered what happened to the money we payed into the union retirement plan ? Dale.. When you find that money, why not donate it to the Logging Museum, we can use it to good advantage. if you get a hold of me at 209-223-4703, I can make a call and see if you vested in a pension at Martell. You never paid Any money into the retirement plan, it was all paid by the Employer through collective bargaining with the Union. Frank Podesta has passed away several years ago. Call me when you get a chance. Addendum to the Editor’s note. The night planer at Standard (Sonora) last day will be Thursday July 30th, the sawmill will probably run their last day August 12th,2009. The Camino mill ran it’s last day July 10th,2009 and is now mothballed as Standard will be soon. Chinese Camp is now a cedar fencing mill, cutting incense cedar and also white fir. I was wondering if anyone could please inform me of what is happening with the logging, timber industry and the mills down there. Also if anybody could let me know if there are any books,pictures or any of the mill worker at the Bendix or America Forest Products mill in Martell .CA (1972-1985) are still around. My father Dan Rosin worked there. I was just sitting here remembering the rides on the carriers and forklifts on the green chain. I was so sad to hear Camino and Standard is closed. I used to haul in there when I drove for Walsh Trucking. Ive since moved, but still would appericate some kind of responce to book, pictures or family friends. Thank you to whoever gets this. Give me a call at 209 223 4703 and I will update you and tell you about a book that’s out there. I work for the CIC and we still represent the workers at the particleboard plant at Martell. Great story. I worked for Bendix/American Forest Products for a few years. Maybe 1981 through 1984 on a seasonal basis. I was a cleat layer in the cover department, and I also stacked logs that were pained with different colors according to their size when they came down the belt from the big saw blade. Guy Ross, Hi. I just read your comment to my writings back in 2009. Was wondering if we might be able to talk sometime. You can call me if your interested. 541-908-0688. Hope to hear from you. THANKS. Anyone have photographic images they could send of the mill in Truckee. I understand SPI had a mill that was closed. Was this mill in operation during the 70s under Bendix or was it built later. I am building a model of Truckee and would like to include this industry. You might try contacting Sierra Pacific Industries for some photos. We don’t have anything on the Truckee Mill. Rick Gianinni, call me 209 223 4703 about possible pension, I will give you a phone number to call and check into it.